If you’ve never had a simit, you’re definitely missing out. And since they’re pretty rare in the US, I’m guessing you’ve never had one. 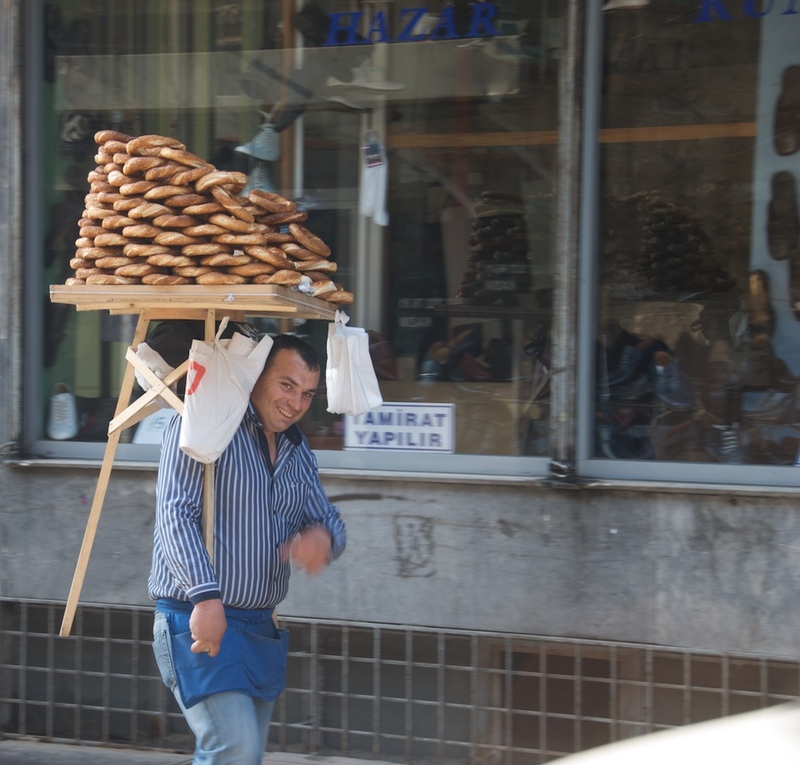 But if you ever make it over to Turkey (and I highly recommend that you do), you’ll be amazed at all the simit. They are the quintessential Turkish food. A bit like the bagel is to NY or the croissant is to Paris. When you travel around Turkey, you’ll see simit everywhere – piled high on trays and street carts, ready to feed the morning crowds. And feed the crowds they do. They’re usually eaten as a snack or for breakfast with feta – chunks of feta, nothing like what we have here – tomatoes, cucumbers, and tea. And though they look like a bagel, they’re much much better than a bagel. They’re a bit crispy on the outside, lightly chewy on the inside, crunchy with sesame seeds, and slightly sweetened due to the grape molasses they’re dipped in. They are the hubbs’ favorite thing from Turkey (he was born there and spent many years as a kid chowing down simit), so when I ran across this beautiful Turkish cookbook, I knew I had to try their simit recipe. And they have become a favorite. They take a bit of time to make, but it’s a pretty straight forward process. Most of the time is spent letting them rise or rolling them out. There’s only one special ingredient you’ll need, and that’s the grape molasses, which is known as Pekmez outside of the US. If you live near a specialty grocery store, or a middle Eastern store, you might be able to find it there. Or good old Amazon has a few options. I’ve also used Pomegranate molasses, which was a bit easier to find. And if you’re worried about buying a bottle and never using the rest of it, Food52 can help you with that. Ok, back to the simits. Time to make Babaanne (aka my amazing Turkish grandmother) proud. These delightful treats are a common occurrence in Turkey, but you don't see them very often here in the States. Make a batch for breakfast and serve them with either feta and tomatoes or jam if you're feeling sweet. Recipe from Turkey: More than 100 Recipes with Tales from the Road, by Leanne Kitchen. Combine the sugar and ¼ cup lukewarm water in a small bowl, then sprinkle over the yeast. Set aside for about 8 minutes, or until foamy, then add another 1¼ cups lukewarm water. Combine the flour and salt in a bowl, then add the yeast mixture and stir to form a course dough. Turn out onto a lightly floured surface and knead for 6-7 minutes, or until the dough is smooth and elastic. Roll the dough into a ball and place in a lightly oiled bowl, turning to coat. Cover with a plastic wrap and set aside in a warm, draft-free place for 1 hour, or until doubled in size. Preheat the oven to 425F and line two baking sheets with parchment paper. Punch the dough down and turn out onto a lightly floured work surface and divide into 10 even-sized pieces. Combine the pekmez with ⅓ cup water in a large bowl. Place the sesame seeds on a large plate. Line up the dishes so you can dunk in the pekmez, roll in the sesame seeds, and then set them on the pan. Working with one piece of dough at a time, use your hands to roll the dough out to make ten 22-inch-long ropes. Fold in half so the two ends align, then lift off the board and use your hands to twist each rectangle into a two-stranded "rope." Place back on the work surface and join the ends together to make a circle, pressing the ends firmly together to seal. Repeat with the remaining nine chunks of dough. Dip each ring, first into the pekmez mixture, immersing completely to coat, then drain well and toss into the sesame seeds, turning gently to coat. Make sure you drain them well after you dip the in the pekmez mixture, otherwise you'll have problems getting the sesame seeds to stick. Transfer to the prepared sheets and set aside at room temperature for about 20 minutes, to puff slightly. Bake in the oven for 15-18 minutes, or until deep golden and cooked through. Transfer to a wire rack to cool. They are best eaten the day you make them, but they will keep, frozen in an airtight container, for up to a month.